Here is our new frame table. 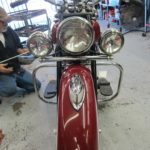 It allows us to restore old original frames. Posted in: Engine Shop. 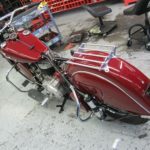 Tagged: Engine Rebuild, Panhead. 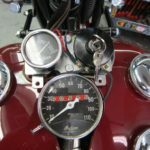 Here is the new motor start-up for Rick’s Panhead. It was a complete engine rebuild. 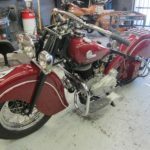 We are putting the final touches on Dennis’ 1946 Indian before start-up and test-ride. This has been an on-going project but we are near the end. 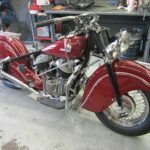 The bike was delivered to us in crates that had been sitting for 20 years. It has come a long way.